Winter has been dragging on for ever in case you didn’t notice. 2 days ago, I put dinner in the oven and had a couple hours to kill before it was ready. I could ride my trainer, or watch a movie, but I was/am sick of being inside. 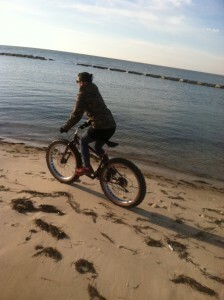 So in an effort to stave off cabin fever, I decided to go for a cruise on my fat bike. When I ride my fat bike (a Surly Pugsley) I don’t do or really wear anything special aside from my snow helmet. I don’t wear spandex anything (jeans and my regular snow boots), and I don’t get out the GPS or heart rate monitor. It’s not a training ride, there’s no Strava, there’s nothing to prove, there isn’t even a set route in mind — I just ride for the sake of riding. Can you get all geared up and make a show of it with your fat bike? Of course you can, but aren’t we too serious about most everything in the cycling world anyways? I always say the Pugsley is my favorite toy. I have showy bikes for all the other stuff, but it’s nice to have an unadulterated tank-of-a-bike for screwing around on, that I don’t need to worry about cracking because it’s carbon fiber, or making it 2 grams lighter. I don’t know how much it weighs, and I don’t care! Snow is the ultimate equalizer — it makes so little difference if your bike is 15lbs or 25lbs once you toss it in 6+ inches of snow — you’re just happy when you can actually pedal through it! 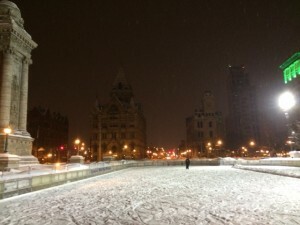 Anyways, I digress from the point I originally wanted to talk about… my nice wintery experience! Being in the bike industry, it’s easy to over-complicate the beautiful simplicity of just riding! Back to it. The weather was perfect, not too cold, but not warm enough to make it slushy. 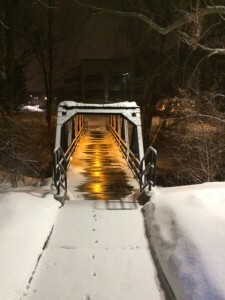 There was a good coating of 3″ inches of fresh snow on the paths. 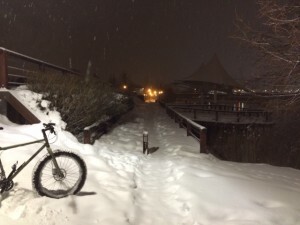 Despite what you might think, if you have no fat biking experience, they don’t do so well in more than a few inches of snow. I turned on my lights, rode down the stairs of my house and headed off for a short adventure. Sunday evenings are a great time for such mini city adventures because no one is out. I barely saw anyone. That, compounded with the quiet and gently falling snow made it a pretty magical experience. I cruised around the neighborhood and then down some abandoned (semi-abandoned?) railroad tracks. Through some more quiet streets and over to the Creekwalk path. There were a few sections where the snow was over knee-high, so there was no biking through that, but for the most part, it was perfect. 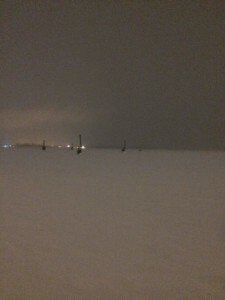 I biked the length to the frozen shores of Onondaga Lake. There was a decent number of blown people tracks close to shore which I followed for a distance on foot as the snow was too deep to bike. Tempted to go out further, I consulted an article on my phone from Syracuse.com, which suggested not walking out on the ice, especially the southern end (where I was). So, I just walked back to shore. On the way back home, I stopped by the skating rink and watched a lone family circle the snow filled rink. On the third time around, the Dad said, “Nice night, huh?” I responded, “Sure is!” Then I rolled home just in time to take dinner out of the oven. I want to see more people out enjoying the weather even if it’s not ideal! You don’t need to make a big thing of it, there’s plenty to do right in the city. 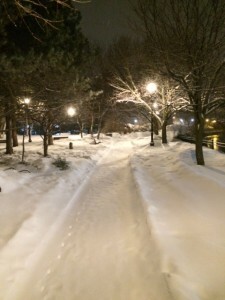 Dust off the old cross country skis or snow shoes and go over to one of the city parks. Or if you want to try fat biking, come borrow one of ours for a day or two. Better yet, help us welcome in spring by buying one! 20% OFF fat bikes, snow helmets and cold weather gear. Nothing guarantees a change in weather like buying sporting goods that are about to go out of season! Just kidding – we ride our fat bikes all year. Here is a picture of us cruising on the beach. And if you only want it for the snow, it’s not like they are going to expire or go out of style. Steel is real and I’ll bet you a nickel the only difference between this year’s and the next is the color. 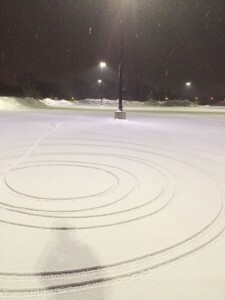 Who says you can’t do donuts on a bicycle? !